Mayne is a man with problems. He's a world-famous rock star with a monster addiction to...well....everything. But what's worse is he can't sleep. See, whenever he starts to dream, it's always of his ex-girlfriend Elizabeth. She had helped him to write "Without You," the song which catapulted his hard rock band into megastardom. But she left him after catching him in a ménage à trois. And then she blew her brains out. Ah, the sweet perils of love and rock, eh? In a speedball-induced fury, our hero goes blazingly insane and begins destroying all of his worldly possessions. Meanwhile, he seems to have set his apartment on fire. In a Nero-esque finale, Mayne plays the damning "Without You" as flames engulf everything. Del James was an early friend of Guns n' Roses. He wrote "Without You" after spending a particularly volatile evening with a pre-Appetite for Destruction Rose and his then-girlfriend Erin Everly. James then showed the story to Rose, who of course loved it. About the same time Rose was working on an epic ballad in the Elton John style. The ballad would become "November Rain," and its video (along with the videos for the preceding "Don't Cry" and the following "Estranged") would serve as an adaptation of the James story. "Without You" would only see publication after its recognition as source material (thus explaining the seemingly conflicting dates above). 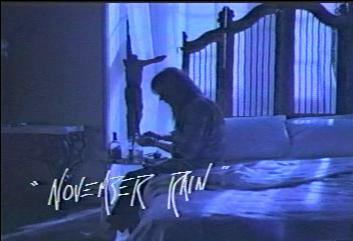 "November Rain" tells the backstory to "Without You" as it occurs in the nightmares of Axl Rose. He marries his beautiful paramour, played by real-life love Stephanie Seymour, and lets Slash totally rock out a solo outside of a church (used in Silverado) in the middle of nowhere. But as the car leaves the church, Stephanie seems less than thrilled. Everything seems groovy at the reception, but then it starts to rain. All Hell breaks loose; the wedding cake is tackled. Something bad has happened. Cut to a funeral service. Stephanie lies in her coffin. Only half of her face is visible, the other half obscured behind a mirror. This is a (pardon the pun) dead giveaway of serious unreconstructible facial trauma...like that caused by blowing off half your face whilst committing suicide. The music hits its rockin' crescendo. Axl visits the grave and cries, doused with yet more of that damned metaphorical (possibly November) rain. Then he wakes from troubled sleep to find himself, not a bug, but a lonely rock star. While the James story ends with the promise of death, the video is much more open ended. The narrative would spill over into the "Estranged" video, wherein Axl is saved by dolphins. Yes, dolphins. It's a happy ending, but the milieu described in the short story would prove to be sadly prescient. The bulk of the text describes the human wreckage in which Manny lives, and it's hard not to imagine it to be a guided tour of Rose's life as he worked on (works on?) the infamous and elusive Chinese Democracy album. But we must retain a bit of the videos' dolphin-promised hope. All of Axl's band retinkering and obsessive sonic construction will someday end. After all, nothing lasts forever, even cold November Rain.